The end of the month is the annual International Auto Show in NYC, which the RainyDayGarage folks last attended in 2006. They skipped the show in recent years because the auto industry was in a tailspin and there was nothing new on the horizon to justify the trip. However, this year they will be back at the Jacob Javits Center to bring you some of the latest in automotive news. The focus for the RainyDayGarage folks will be to see what is new in the world of hybrids and alternative fuel vehicles. The 918 Spyder, a two-seat mid-engine supercar with hybrid and electric drive technology, debuted at the Geneva Auto Show. Porsche has reported that the 918 Spyder Concept can manage 100 km/h (62 mph) in less than 3.2 seconds, with a top speed of 198 mph. The 918’s course time at Nürburgring was less than 7 minutes 30 seconds, which means it’s FASTER than Porsche’s Carrera GT supercar. Not bad for a hybrid! We hope to get a chance to check it out in New York. 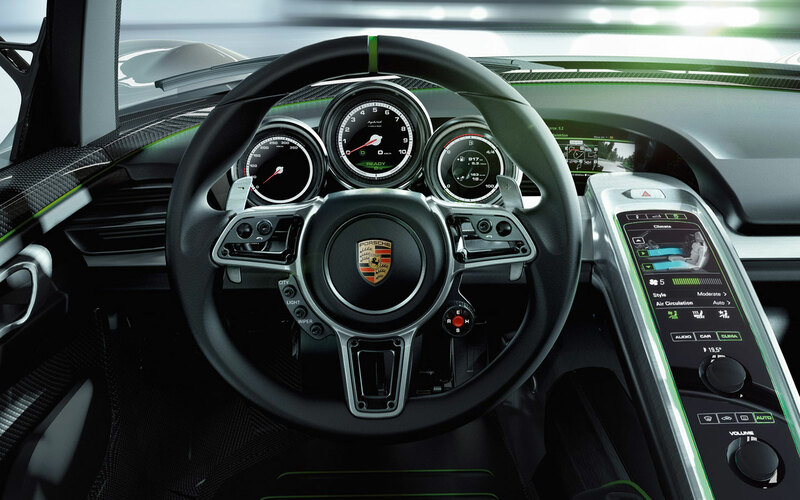 The interior of the Porsche 918 Spyder Concept looks to be futuristic with design cues from the past, and is clearly still driver-focused. Love the three circular dials. The left dial displays the road speed; the middle dial displays engine speed; the right dial is for energy-management. We are not sure what the controls are in the center console. According to Porsche, the touch screen enables the driver to manage and “intuitively” control the car’s functions. We like the direction companies like Tesla Motors and Porsche are going with their new alternative fuel vehicles. The auto industry has had a hard time of late, but we are starting to see a glimmer of hope from the upstarts and the more nimble veterans. This is the spirit with which we will attend the show. We are hopeful for the future of the automotive industry and we hope to see more of it in this year’s International Auto Show in NY.